Chile, like any country, has many legends and myths. Some help explain natural phenomena, some help teach children lessons, and some are just good stories. I’ve mentioned a few Chilean legends before, but here is a larger collection of Chilean myths and legends. This myth helps explain the beautiful green color of a lake near Portillo, Chile. Legend has it an Inca man fell in love with an Inca princess whose eyes shone like emeralds. They were married on a mountaintop, and as they were coming down the mountain, the bride slipped and fell to her death. The man wanted to give her a special tomb, so he decided she would be buried in the lake. As she sank to the bottom of the lake, the waters turned the same color as the princess’s eyes. 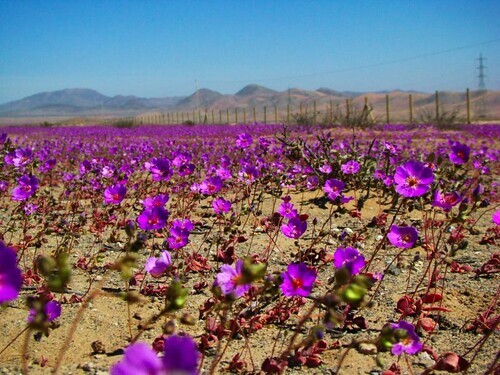 Desierto Florido means “desert in bloom.” This is the story of how certain weather patterns create a bloom of beautiful wildflowers in desert areas in the north of Chile. A beautiful woman lived in a small village and all the men admired her, but she loved none of them. One day, a miner came through town, looking for gold. He too fell in love with the woman, and this time she loved him back. One night, the miner had a dream about where he could find a vein of gold. He left the next morning, promising to return quickly, but he never did. As the woman waited and waited, she eventually died of grief. The villagers buried her in a field, and the field began to grow beautiful wildflowers. In this Chilean legend, a woman deceived her family by being a housewife during the day and a witch at night. She would use potions to turn herself into various animals and play while her family slept, then use another potion to turn herself back into a human when morning came. One night, she forgot to make sure the children were asleep, and they saw her turn into a sheep. As she ran off to play, the children wanted to imitate her and turned themselves into foxes. When they couldn’t turn back into children, their cries woke their father. Seeing what had happened, the father threw all the potions into the river in a rage. When the wife came home, she couldn’t turn herself back into a human and was doomed to remain a sheep. These Chilean legends come from an island in Chile’s south, Chiloe. There are lots of fishermen there, so you can imagine there are legends about mermaids and ghost ships. The mermaid is named Pincoya, and she has beautiful golden hair. Now and then, she will come ashore and dance. If she faces the sea while she dances, the fish harvest will be plentiful. If she dances facing the mountains, with her back to the sea, fish will be scarce. The Caleuche is a ghost ship crewed by those who have drowned. Some say that Pincoya takes them to the ship. The ship appears at night and is always full of light and sound as if a party is going on onboard. Las Tres Pascualas, three sisters who all loved the same young man. La Tirana, the story of ill-fated lovers that accompanies a festival in northern Chile. What are some of your favorite Chilean myths and legends? Picture by Desestructurar para volver a pensar.